A worldwide genetic pool was placed in Sagarmatha\'s care to provide marijuana smokers and growers with fresh, original varieties of marijuana. After more than 10 years of service they have emerged as a creditable source of connoisseur quality cannabis seeds. They will continue to provide a variety of delectable treats for the many marijuana farmers of the world. These \"magic beans\" have given Sagarmatha and friends many hours of enjoyment and entertainment. 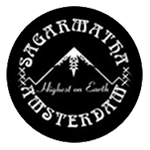 We believe Sagarmatha\'s peaks will give our customers the highest cerebral views and physical sensations possible with marijuana.